Technically, Team Sky’s Lars Petter Nordhaug won the inaugural Tour de Yorkshire, but I think we can all agree that the real winner was, on balance, me. Not only did I foresee that the race wouldn’t be anywhere near as sprinter-friendly as some (presumably non-cyclists) seemed to believe, I also correctly predicted the King of the Mountains competition. I said that Nicolas Edet – who several of you have surely never heard of – would get in the break. He did – twice – and in so doing secured a pink jersey which was then made frighteningly hideous with the addition of a big panel of his red Cofidis jersey across the front. I hope you had a quid on. I didn’t. I didn’t know that Ben Swift would crash out on the first day and while I did suggest that Marcel Kittel would struggle to be in amongst the leaders on the hilly-on-the-sly first stage, I didn’t imagine he’d be out the back and abandoning inside the first 100km. In the end, that first stage decided the race. It was brutal enough that only five riders arrived at the finish in the front group with Nordhaug winning the sprint ahead of Thomas Voeckler. Voeckler was to lose six seconds thanks to a split in the bunch on stage two, which dropped him to third overall behind another rider I tipped before the race, Samuel Sanchez. Was the race a success? The most important thing for any race is to have a shitload of people watching. In that regard, the Tour de Yorkshire delivered. Well-known, highly-regarded races are dropping off the calendar or going bust left and right and so this event seems to me to be the future. 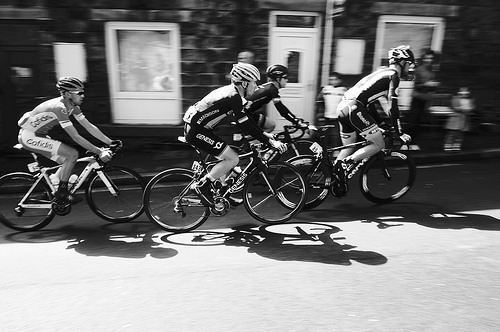 In the UK, the popularity of road cycling is growing. I can well imagine next year’s edition being given a higher rating which will also bring a stronger field. It’s a virtuous circle. Does the Tour de Yorkshire fill a niche? I can also see the Tour de Yorkshire carving a niche for itself as a sort of stage race for classics riders. There are plenty of races for Grand Tour contenders already, but the end of spring is something of a dead end for many in the peloton. The Tour de Yorkshire delivers similar terrain at a time of the year when those riders are still in decent form but largely unoccupied. If you’re wondering what the difference is between a day spent cycling across Yorkshire and a tough day in the Alps, it’s to do with gradients. 10km at 7% is on paper ten times harder than 1km at 7% but average gradients hide a multitude of sins. A 1km segment of an Alpine climb is indeed 7%. A British climb, however, might vary from 1% to 20%. On steeper stuff you run out of gears and on shorter slopes riders also tend to try and go faster. This makes different demands on the body. Up to 6% or 7% you can sit down and spin the pedals much the same as you would on the flat. You can control your effort and riders who excel are those who are aerobically efficient and light. When the gradient kicks up, or the other riders are climbing quicker, you need to recruit more muscle. Physiologically it becomes a different task. We saw on stage one that these short climbs can fracture a field and the frequency of them also means that you’re never far away from an opportunity to attack. Great crowds, a big organisation behind it, UK TV coverage and ideal terrain for racing that’s distinct from that found in other races – what’s not to love about the Tour de Yorkshire? While I’m all for less Liggett/Sherwen on TV, Boulting talking over the top of David Millar got to be pretty grating. Although I find Boulting grating anyway, and Millar whatever the opposite of grating is… shaving? I think they were both guilty of that. I suppose they’re both new to the job really. They urgently need to work out a system.